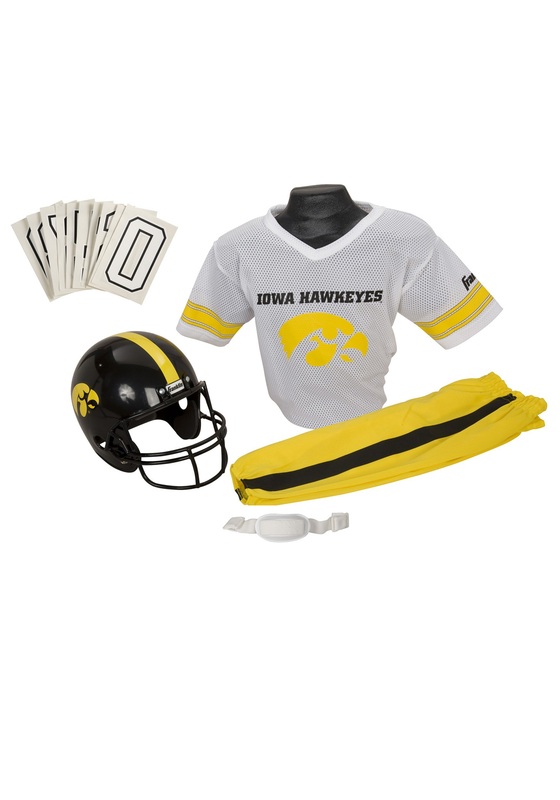 Watch Herky plant the flag, then get ready to fight, fight, fight for Iowa wearing this Iowa Hawkeyes Child Uniform! It has realistic details that make it look just like the real Hawkeyes' road uniforms, and includes iron-on numbers so you can customize the jersey to you and your child's liking. He can be his idol, or he can start carving out an athletic brand of his own, for future generations to idolize! Any young Iowa fan will love imagining being a part of all the traditions—not to mention the big game—in this 100% polyester jersey costume featuring gold-and-black pants, a black helmet with a gold Hawkeye logo on the sides, and chin strap that snaps to the sides of the helmet. On, Iowa! NOTE: The helmet is not to be used for protection when actually playing football or any other contact sport.